Move over, acai: there's a new Brazilian superstar fruit in town. Camu camu is becoming increasingly popular as a health supplement for its supposed antioxidant properties. But is there something to this rain forest fruit or is it just about the hype? This isn't a fruit you'll find on a tree or bush in your neighbourhood: camu camu mostly grows in flooded areas of the Amazon rainforest in Peru, Brazil, Colombia, and Venezuela, where its fruits and leaves are used for medicinal purposes. Its fruits are about the same size as a lemon, but light orange in colour, and full of vitamin C.
Natural health aficionados claim that camu camu has anti-viral properties that can help with cold sores, herpes, shingles, and the common cold. Others say it's a natural energy booster that's great for your eyes and gums. 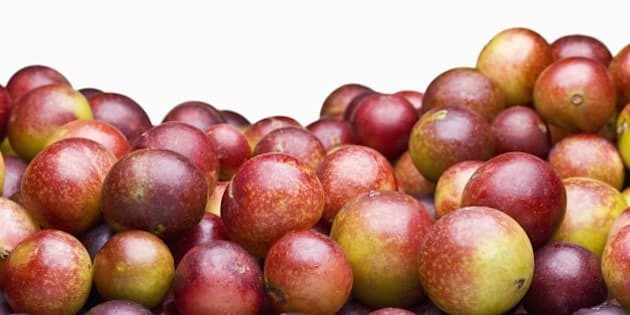 The research on camu camu is still limited, but we've got a round-up of its potential benefits and some hints on including it in your diet. Camu camu is chock full of vitamin C: 60 times more per serving than an orange! A teaspoon of camu camu powder has 1180 per cent of your recommended daily intake for vitamin C, which is important for gum health, among other functions in our body. Valine is an amino acid found in camu camu. It's an essential amino acid, meaning that we must get it in food because our bodies can't produce it. Valine is used by the body to prevent muscle breakdown and is important for nervous system and cognitive function. Our bodies need potassium for the proper functioning of the heart and kidneys. Camu camu is one way to get it: 71.1 milligrams are found in every 100 grams. This is another essential amino acid found in camu camu, one that our bodies need for muscle and bone tissue growth and recovery and the production of growth hormones. Another amino acid! This one is key for digestion: serine helps to break down the bonds in proteins and polypeptides so they can be used by our bodies. Camu camu has several different flavonoids, which are compounds that are found in plants and are part of what gives fruits and vegetables their awesome colours. They mostly function in the body as antioxidants, neutralizing harmful free radicals. Gallic acid is found in camu camu, which is good news because it appears to have anti-fungal and anti-viral properties. It also acts as an antioxidant. This is another acid with antioxidant properties, found in camu camu. It's been studied for anti-cancer effects, though research is still very early. Some research also indicates that ellagic acid has anti-diabetes effects. In one study, 20 male smokers drank camu camu juice or took vitamin C tablets daily for a week. The group who took camu camu showed a decrease in some markers for antioxidants and oxidative stress at the end of the study, compared to no change for those who had vitamin C tablets. Camu camu berries are not exactly sold in your local North American supermarket, but you can include it in your diet in tablet or powder form. The powder can be used to flavour other foods, and camu-flavoured ice creams and drinks are popular in Peru. There is some concern that camu camu can interfere with some chemotherapy medications—you should always let your doctor know about the supplements you are taking, but especially so if you are receiving chemo, for example.